For years, the Environmental Protection Agency has been conducting programmatic 'economic analyses,' also known as Regulatory Impact Analyses (RIAs), to assess the economic effects of its regulatory efforts. This important volume explains the purpose of these analyses, along with their design, execution, conclusions, and their ultimate impact on environmental rules. 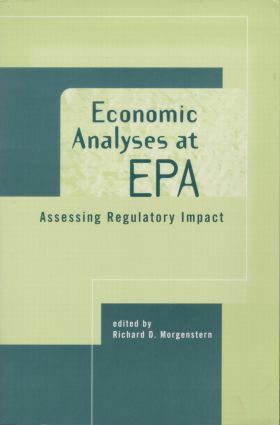 Richard Morgenstern, formerly director of EPA�s Office of Policy Analysis, has assembled twelve original case studies of RIAs performed over the past decade on matters such as lead in gasoline, ozone depletion, asbestos, clean drinking water, and sewage management. The contributors, most of whom actually worked on these RIAs, provide detailed examination of why and how they were performed. The case studies critique the nature, amount, and quality of data used by the EPA in their benefit-cost and cost-effectiveness analyses as well as the use (or abuse) of the results in final decisionmaking. The authors illustrate how the analyses take into account difficult issues such as discounting, risk, nonmonetized benefits and costs, and equity. Morgenstern provides the necessary historical context and the legal framework for requiring and conducting EAs. He describes new procedures outlined by the Clinton administration and synthesizes the case studies into thoughtful cross-cutting conclusions, drawing important lessons that will improve future analyses.